Very few players can match the overall success and career longevity of Peyton Manning. The future Hall of Fame quarterback made the Indianapolis Colts into one of the greatest franchises of the 2000s and brought the Denver Broncos back to the elite levels of the NFL. 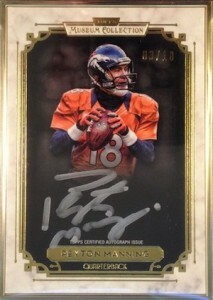 Peyton Manning is among the biggest collecting options in the hobby and his autographed cards are the clear favorites. 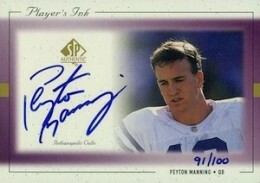 Shop for Peyton Manning autograph cards on eBay. Although he came into the NFL right before the time that autographed cards began to dominate the hobby, there is no shortage of his signed cards. 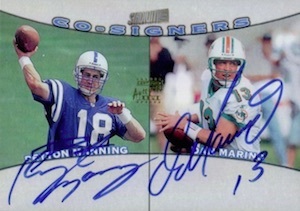 The first Peyton Manning autographs came during his rookie season and have been included in every season's products since then. When talking about Peyton Manning autographs, the most popular options are his ealiest autographed cards with the Colts and his on-card autographs with the Broncos. While some are more popular and valuable that others, the reality is that any authentic Peyton Manning autograph is a worthwhile addition. 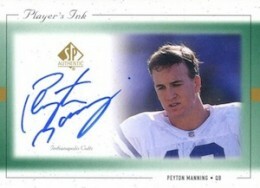 The following list looks at ten of the best Peyton Manning autographed cards available to collectors. Given the sheer number of signed cards, it is by no means definitive. 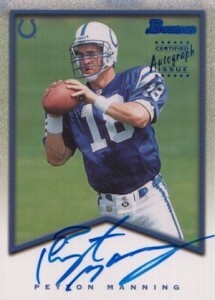 Are there any other Peyton Manning autographs that you are partial to? Let us know in the comments. Click on the image or listing to shop for cards on eBay. 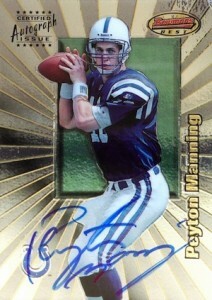 These early Peyton Manning autographs were no easy pull and the 11-card checklist combined to fall 1:360 packs. In addition to the base blue foil version, there is a silver foil and gold foil parallel. Another first-year signature for Manning, Bowman's Best Autographs included rookies and veterans in the small checklist. Every player, including Manning, has two on-card autographed cards, each with different images. There are also Refractor and Atomic Refractor parallels. 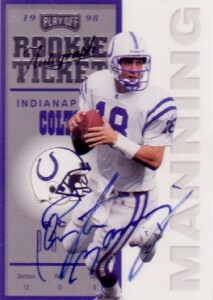 Any list of top Peyton Manning cards would have to include his Playoff Rookie Ticket. This is one of the most iconic modern football cards and one of the top Peyton Manning cards of all-time. The announced print run of the card is 200 copies and since it was released in 1998, there are not many of these floating around. 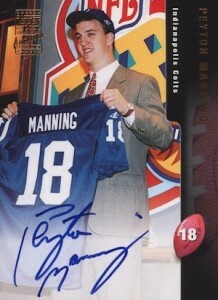 While the actual design of the card may not look that notable, the fact that his first-year card for Manning is signed on-card is enough to drive collectors crazy. 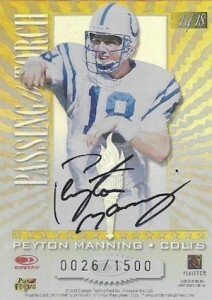 Unlike the rest of the checklist, this Manning card can be found with either gold or bronze foil on the front. Although Dan Marino was on his way out when Peyton Manning joined the league, any short list of top quarterbacks would likely include both players. Stadium Club Co-Signers features the two elite QBs with on-card autographs. 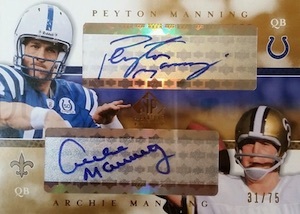 Another dual signed card for Manning, this Passing the Torch autograph includes one signature on each side of the card. While Johnny Unitas is on the front and Manning is on the back, it is likely those spots would be reversed now. The print run of 1,500 is a bit misleading since only the first 100 copies were signed and the rest were just a numbered insert. There is also a signed version that features only Manning, also limited to 100. Although it is a card with a simple design, this 1999 release for SP Authentic is refreshing example of how less can be more. The green version is more common of the two and the purple version is hand-numbered to 100. Jumping ahead many years, Manning joined the Broncos in 2012 but on-card autographs were largely unavailable until 2013. One of the top options includes his Jumbo Prime Booklet Signatures card found in 2013 National Treaures. While the on-card autograph is great, the large game-used jersey patch takes it to the next level. In the current football collecting world, Five Star and National Treasures stand near the top. 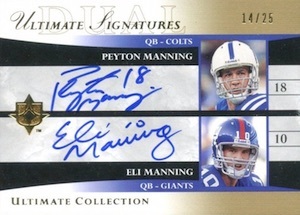 While the print run of 115 makes it more available that many other current autographs for Manning, the brand power of Five Star and the appealing look of the card make it a clear winner. As the rarest card on the list, this Framed Gold Autograph for Peyton Manning is pure class. 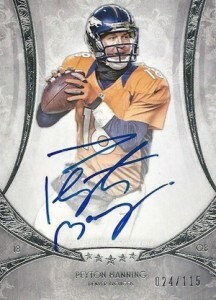 The ornate look and silver ink make it stand out among even the nicest Peyton Manning autographs. Gold ink might have made more sense but that is a small issue for such a great card. When your dad and brother are also pro athletes in the same sport and at the same position, it is no surprise that this fact would be documented on a card or two. There are quite a few signed options that pair Peyton with Archie and/or Eli and they can be a cool reminder of how important the Manning family has been to football. 2001 SP Sign Of The Times Peyton Manning Auto Issue - #PM! PSA 9! 1998 Collector's Edge Peyton Manning Rookie Ink RC BGS 9 MINT Auto 10. HOF. PSA?